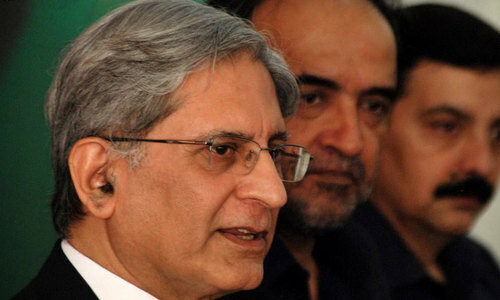 ISLAMABAD: The Pak­istan Peoples Party (PPP) after a meeting here on Tuesday decided that it would not withdraw its presidential candidate Chaudhry Aitzaz Ahsan and that it would continue its efforts to persuade Jamiat Ulema-i-Islam (JUI-F) chief Maulana Fazlur Rehman to withdraw from the race for the sake of unity and to save the opposition from “total embarrassment”. 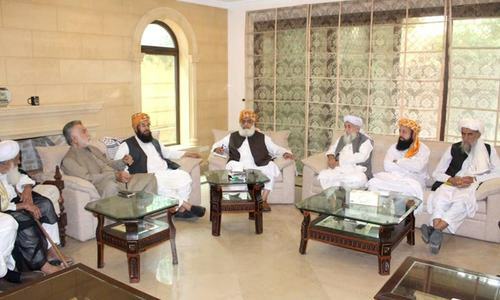 Soon after the meeting presided over by former president Asif Ali Zardari, a PPP delegation met the JUI-F chief at the latter’s residence to convey to him the party’s decision and to make another request to him to withdraw his candidature. 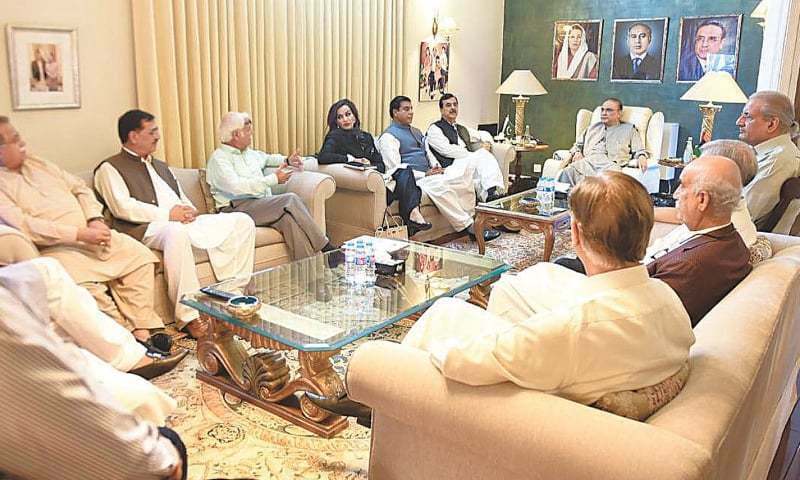 Those present in the meeting included Syed Khur­sheed Shah, Chaudhry Aitzaz Ahsan, Yousuf Raza Gilani, Qamar Zaman Kaira, Sherry Rehman, Farh­atullah Babar, Raja Pervez Ashraf and Raza Rabbani. “It is not possible for us to withdraw Aitzaz Ahsan at this stage,” declared PPP Secretary General Farh­atullah Khan Babar in categorical terms while talking to Dawn after his party delegation had met the JUI-F chief. Mr Babar said by nominating Maulana Fazlur Rehman as the presidential candidate, the Pakistan Muslim League-Nawaz (PML-N) and other parties had put the PPP in a difficult situation because his party had special relationship with him. He said the Maulana had also reciprocated the same feelings, but told the PPP delegation that he could not take the decision on his own since he had been nominated by all the other opposition parties. Despite this, he said, the JUI-F chief had agreed to consider the PPP’s request and would apprise the party in a day or two. Talking to the reporters after his meeting with the PPP team, Maulana Fazlur Rehman also said that they still had “two nights” to find the solution as the Election Commission of Pakistan (ECP) had set August 30 as the date for issuing the final list of the candidates for the Sept 4 presidential elections. Mr Babar said the party had requested the Maulana in a polite manner to “reconsider” his decision to bring the opposition parties out of the present difficult situation and to see the whole scenario on merit of their arguments and the candidate. “We will wait for his response now,” he said. Sources in the PPP said the issue of removing Senate Chairman Sadiq Sanjrani through a no-trust move had also come under discussion during the internal party meetings and the combined meetings of the opposition parties. 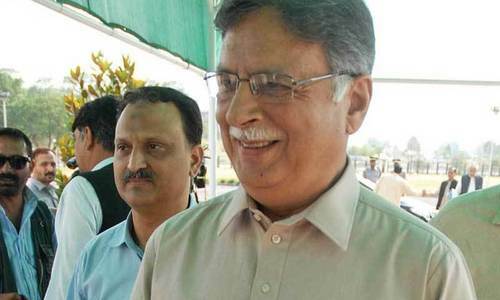 The sources said that the proposal to remove the Senate chairman, who had been elected in March when the PPP had joined hands with the Pakistan Tehreek-i-Insaf (PTI) during the elections of Senate chairman and deputy chairman. However, the issue was put on the backburner for the time being because of the elections of the speaker, deputy speaker and the prime minister and now the upcoming presidential election. Mr Babar also confirmed that the issue did come up under discussions, but no final decision was made. “The opposition parties are conscious of the possibilities in the Senate. No concrete decision has been taken by any party or by the opposition,” Mr Babar said when asked, if the issue of the Senate chairman’s removal was under their consideration. Similarly, when contacted, Opposition Leader in the Senate and PML-N chairman Raja Zafarul Haq also confirmed that they had discussed the option of removing the Senate chairman, but they would do it only after discussing as to who would assume the office after Mr Sanjrani’s removal. Responding to a question, Mr Haq said that the PML-N was not in direct contact with the PPP on the issue of the presidential candidate and Maulana Fazl had been negotiating with the PPP on behalf of the whole opposition. Of course PPP was going to stick with Aitzaz as candidate for president , because of two reasons. First, so Arif Alvi would become the President and second (the main reason), Mr Asif Ali Zardari stay away from prison. PPP is supporting PTI. They have done the same during the selection of Chairman Senate. Good for Aitzaz and bad luck for Fazal-ur-Rehman and PMNL. In the future, cracks will widen and eventually, so called 'Grand Alliance' will collapse. This is my analysis. @Rumi corrupt parties trying to stop the people person IMRAN KHAN! !